Autodesk University is occurring Dec 2-5 in Las Vegas, and I would encourage you to attend if you can especially if you like the technical side of things. Last year we had over 9 000 people at Autodesk University, if I remember correctly. Also we're doing something new this year, we are asking you to help us select the sessions for AU. 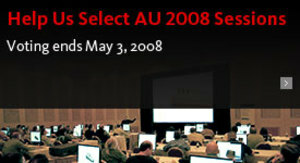 All of the session abstracts that were submitted by the deadline have been uploaded to the AU 2008 Session site. Topics are organized under 19 tracks, which are either an industry or a product. If you are thinking about attending AU, take a look at the session abstracts, and then Vote for AU Sessions that you would really like to see. The deadline for voting is Saturday, May 3, 2008. Over the next few weeks, we will review your input and whittle the sessions down to the number we can actually physically accommodate in the Venetian Conference Center in Las Vegas. The Open Source Geospatial Foundation OSGEO is hosting FOSS4G in Capetown, South Africa, Sep 29 - Oct 3. In February of this year South Africa adopted a national policy on open source, National Open Source Policy in Government , so this is an opportune time to increase awareness of open source gesopatial in Africa. According to the head of government communications in South Africa "All new software developed for or by the government will be based on open standards and government will itself migrate current software to FOSS." It is intended by April that CSIR and the State Information Technology Agency will setup a project office by to assist in implementing FOSS throughout South Africa. Autodesk and Google have already signed up to be sponsors of the 2008 event. In 2007 about 700 developers and users of open source geospatial software got together in Victoria, Canada. Under the Greenhouse Gas Reduction (Cap and Trade) Act announced yesterday, large emitters will face caps on their emissions. In what may become a continental carbon market, large emitters will be able to buy and sell emissions allowances or buy offset units. The concept is to make it financially beneficial to cut greenhouse gases. British Columbia is the first province in Canada and the first jurisdiction in North America to implement a cap and trade system. 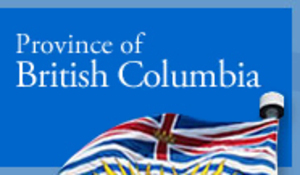 This follows British Columbia's pioneering carbon tax that was passed earlier this year. There are many misconceptions about open source that many of us encounter, one of which is that open source developers are hobbyists working in the garage in the evenings and weekends. A recent report Linux Kernel Development: How Fast It is Going, Who is Doing It, What They are Doing, and Who is Sponsoring It from the Linux Foundation reports some statistics for GNU/Linux that may surprise many people. This is really a massive development effort, something like 1,000 developers working for more than 100 different corporations. Most of these developers are being paid to work on Linux, it is estimated that between 70 and 95 percent of these developers are being paid for their work. Equally impressive, on average 3,621 lines of code are added to the kernel tree every day, and a new kernel is released approximately every 2.7 months. Since 2005, the kernel has been growing at a steady state of 10 percent per year.